The Egyptian pound is the official currency for the Arab Republic of Egypt. The pound is divided into 100 piasters. The ISO code for the Egyptian pound is EGP, although LE is also frequently used as notation. In Arabic, Egyptian pounds are called gineih, and piaster is called qirsh. 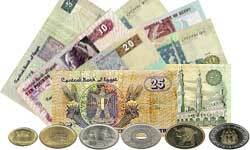 The Egyptian pound is mainly a paper currency and there are various denominations. The coins are used for fractions of the pound. Paper notes are available in denominations of 200, 100, 50, 20, 10, 5, 1, 50 piasters and 25 piasters. Coins are available in denominations of 1 EGP and 50, 25 and 10 piaster. There are two interesting peculiarities of Egyptian currency. The smaller the note denomination, the smaller its physical size. And all Egyptian notes are bilingual, with an Arabic and English face. The Arabic side has pictures of Islamic buildings in Egypt. The English side show ancient Egyptian motifs with engravings of figures, statues and temples. Currency import and export is limited: local currency (Egyptian Pound) up to EGP 5,000.- and foreign currencies up to USD 10,000.- or its equivalent in freely convertible currency. Currency exchange is available at official banks, official money exchange offices or in the bigger hotels. Banks often have a better exchange rate, than the exchange offices or the hotels. All common international currencies are accepted. Scottish and Northern Irish bank notes are not exchangeable in Egypt. Banking hours are from 8.30 am to 2 pm (Sunday to Thursday) in the major towns and cities, with smaller towns and villages operating a more varied timetable. The banks are closed Fridays, Saturdays and most holidays. Cash machines are quite common in Egypt, especially in the main tourist areas. Try to get plenty of small bills, as it can be surprisingly difficult to get change. When you order your Egypt currency, get plenty of 5 and 10 pound notes, plus some 1 pound notes to pay for public toilets. American Express, Diners Club, MasterCard and Visa are accepted, but generally only in bigger hotels or restaurants in Cairo and restaurants in tourist areas. You may avoid additional exchange rate charges by using traveller’s cheques in US Dollars, Euros or Pounds Sterling.